I've had my apple watch now for about a month. I had been thinking about getting one for a long time, ever since apple announced its existence last year. However, I'd done my best to resist temptation for as long as I could. I didn’t really have the money and, like a lot of people, I was struggling to really justify it in terms of ’things it can do’. Ultimately my curiosity and fascination with new technology got the better of me and I took the plunge. Now that I’ve had it for over a month, I really love it and have no regrets about getting it. However, what I’ve noticed is that it’s really difficult to explain why I love it so much. After a few failed attempts, I think I’ve found the answer. If you’ve recently bought an Apple Watch and you’re looking to avoid frustrating conversations with everyone you know, here’s how to approach that conversation. "Oh is that an iwatch?" Well, no it's not an ‘iwatch', it's an ‘Apple Watch', but don't correct them. To be honest, it’s interesting that it’s not called an ‘iWatch’, but it wouldn't be a strong start to the conversation, and the chances of coming across as a pretentious show off are hugely increased. "What does it actually... Do?" At this point, you'll enthusiastically list off a few things that you use it for: changing music when you’re on the tube, getting directions while you're walking somewhere and seeing notifications on your wrist. Awesome right? Wrong. It’s not impressive that you can see notifications and it’s not a particularly painful problem to change your music the old fashioned way. They’ll either politely smile and say “Oh…”, or they’ll be a bit more blunt and say: “But I can do all that on my phone. What’s the point?" At this point, if you’re not emotionally ready to defend your purchase choices then just change the topic and move on. Because what’s going to happen is they’re going to try to get you to convince them that they should buy an Apple Watch. If in the next 10 minutes you can’t make the sale then you’ll officially have wasted your money and there’s no coming back from that. 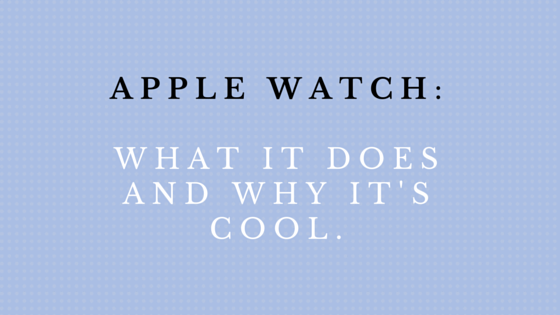 I guess maybe it’s because people really want to want an Apple Watch, but they don’t really get it? I can understand that, smartwatches are a new type of thing and it can be tough to visualise something totally new. Whatever the reason, don’t get fooled into thinking that you’re just chatting about how much you enjoy your new gadget. You’re Jordan Belfort now and you’ve got to make the sale or die trying. Let’s say you decide to help them understand how great it is. What do you tell them? What they want to hear about is some incredible killer feature that they can easily imagine fitting in to their lives. Think about how iPods changed listening to music. When you first saw an iPhone you could already think of 10 different concrete ways that your life would be significantly different to before. They weren’t impressed by the wrist notifications, so you'll try and impress them with a killer new feature, you know, like iPhones and iPods had! Nope. Bad idea again. There are things that you can do with an Apple Watch which are clearly new, but they can come across as more of a gimmick than a killer feature. For instance, there’s a camera app which turns on your phone’s camera and allows you to take a picture. The watch even acts as a mini monitor so you can make sure it’s looking the right way. E.g. Now this does usually get more of an enthusiastic reaction, but it doesn’t matter. You’ve already made your fatal mistake. Because yes, it is pretty cool and you can take some funny selfies where people don’t know whether to look at the watch or the phone, but it’s short lived surprise rather than long term impressiveness. Now, you’re implicitly making the argument that the watch/camera trick is the best reason there is to get an Apple Watch, and that’s not a good enough reason. There are other ‘tricks’ in a similar vein that seem cool, but have no practical use. I can leave my phone in my bedroom and then go to the kitchen and tell siri via my watch to play music which will come from the lounge where my Apple TV is set up. It’s complicated and I felt very pleased with myself when I did it for the first time. I don’t think the world is a better place for my being able to do it though. The problem with these things is that once you get over the surprise, you realise it’s the exact same problem as attempt number 1: The watch doesn’t really do anything that your phone doesn’t do. And once you’ve got to that point in the conversation, everything falls apart. Before you know it, you’ll be facing challenges over whether they can use their phone to call someone faster than you can using your watch. Best case scenario is that you win and you have a super expensive speed dialler. Worst case scenario is you lose and you’re the moron who buys expensive technology that you’ve demonstrated is a step backwards. Nightmare. Of course, this is all to highlight the fact that if you’re looking for a killer feature, then you’re looking at it the wrong way. The Apple Watch isn’t about life changing new features, it’s about reducing friction in a thousand small ways. When you shine a spotlight on it and think about notifications in the abstract, then it’s hard to see the advantage. But it’s a fantastic feeling to be able to, for example, get directions to somewhere new without having to have your phone out the entire way. Now I can just look at my watch, tap a couple of times and set off. My watch lets me know when to get off the bus or train in a subtle, unobtrusive way. I’m no longer the guy staring at his phone like a tourist, I can keep my hands free and relax a little bit. There are a thousand other really small instances of my watch removing friction and blurring the line between technology and real life. It’s in those little moments that the Apple Watch shows it’s true value. And this surely represents a sign of the things to come. Technology in the next 25 years will become more increasingly invisible and more integrated to how we actually live our lives. The ‘Internet of Things’ is well and truly on its way. Contrary to popular opinion, we’re not going to become techno-zombies with our faces permanently absorbed by some screen or other. They next step in the evolution of technology will about getting the screens out of the way and reducing the friction that comes with using technology so you can get on with living life! Perhaps that’s overly optimistic? I don’t think so, but the important lesson is this: If you have an Apple Watch and someone asks you what it does, don’t tell them about features, tell them about friction.